Michael McFadyen's Scuba Diving - Toothbrush Island The Five Islands Nature Reserve is composed of, as you would imagine, five islands a couple of kilometres from the city centre of Wollongong. The diving off all of the islands is basically good, with number of spots being exceptional. The northern end of one of the Five Islands, Flinders Island (better known as Toothbrush Island since it looks so much like a toothbrush), is a shallower dive (about 16 metres) with two very good caves. The best boat ramp is in Outer Port Kembla Harbour behind the BHP Steelworks. From here, head out to the distinctive island, go to the northern end and round it so that you are just on the eastern tip. The larger of the two caves, is on this north eastern corner of the island. At this location there are a number of gutters that run west-south-west to east-north-east (for the rest of this article I will refer to east and west rather than the exact directions). The west-south-west end of the gutters face the island. The northern most one actually points right towards the reef at the northern end of the island. The second one should be able to be picked up on your depth sounder as you run parallel to the island about 20 metres or off the island. Anchor to the south of the gutter. The depth here will be about nine metres on top and about 14 metres on the bottom. Once you descend, if you see a large gutter (say three metres wide) running west, then this is probably the second gutter. You can start your dive by going up this towards the west. The depth rises from 14 metres to about 10 metres. Over to your left is another gutter, about 15 metres distant. However, for noew head back down the gutter to the open end (east) and then south or south-east. After a short distance you will see another gutter. This is much narrower than the one you have been in. It is maybe two metres at the mouth. As you swim up it to the south, it narrows even further and is only a metre or so wide at one location. There are often lots of seapike in this area. Just past here is an interestion. There is another larger gutter running east-west. Cross this gutter and the smaller gutter you are in has almost disappeared. A few metres on there is another gutter running east-west, this one nowhere as deep or obvious as the others. Straight away there is yet another. This is right outside the entrance to the cave. The cave runs back under the island and has a long arm that goes off to the right back about 15 or 20 metres. The rest of the cave is about 10 metres deep and a few metres high at the front. 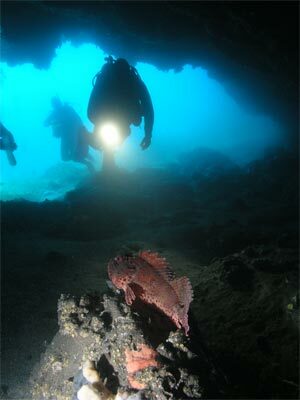 There are some small gorgonias in the cave and you will see lots of red rock cods inside. You can get some nice photos, but be careful you do not stir up the fine silt on the floor. The depth of the cave underwater is about 10 metres. Once you are finished in the cave, come out and head east along the wall. This runs at first on the edge of the island and then out away from it. After 30 metres the wall turns south. Follow it and in another 30 metres it heads west again. The depth all along this section runs from 10 metres near the cave to 16 metres. The bottom is rock with kelp. There are some small boulders on the bottom and at one spot you will see sand. When you come back and reach the first corner after the cave, (that is you turn from going north to west), go away from the wall and you will see the small wall on the other side of the last couple of larger gutters you crossed on the way to the cave. You will then cross the narrow gutter and can explore the closed ends of the three west-east gutthers. After this, head east along the third large gutter you encountered (the first one seen when in the narrow gutter) and cross this intersection. Keep going east, examing the bottom and both sides of the gutter. You will see sea dragons on the floor of these gutters in among the kelp. When you reach the end, turn left and follow this back past the narrow gutter entrance and the first large gutter you explored. About 10 metres past the first gutter you will see another large gutter running west-east. This does not have a distinct northern wall like the other ones. Follow it towards the end and you will see that you are off the end of the island. Return back to the anchor. Further around on the eastern side of the island is also quite good. In summary, the Wollongong area has some excellent dive sites, with the most outstanding being the wreck of the SS Bombo. 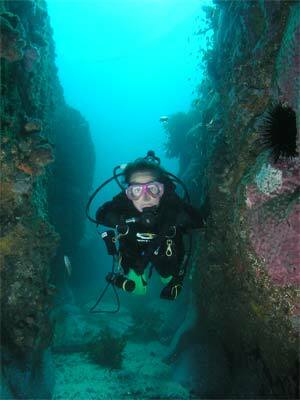 This dive makes a great second dive after the Bombo or Pig Island. You can dive here using United Diver who run from Wollongong Harbour. I recommend Leon's service as been up there with the best in NSW.